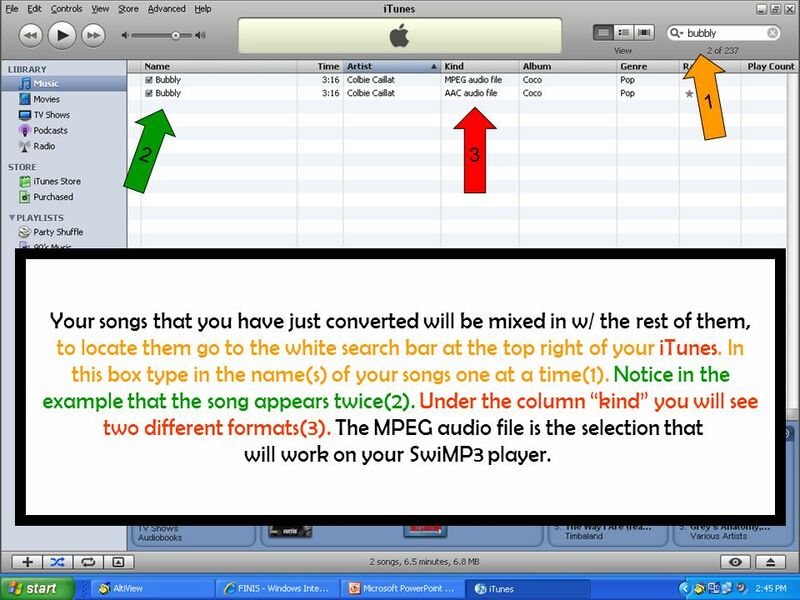 1 How to utilize your iTunes for use with your SwiMP3 Please be aware that all the SwiMP3 line of players do not have licensing to any of the songs that are purchased through iTunes. 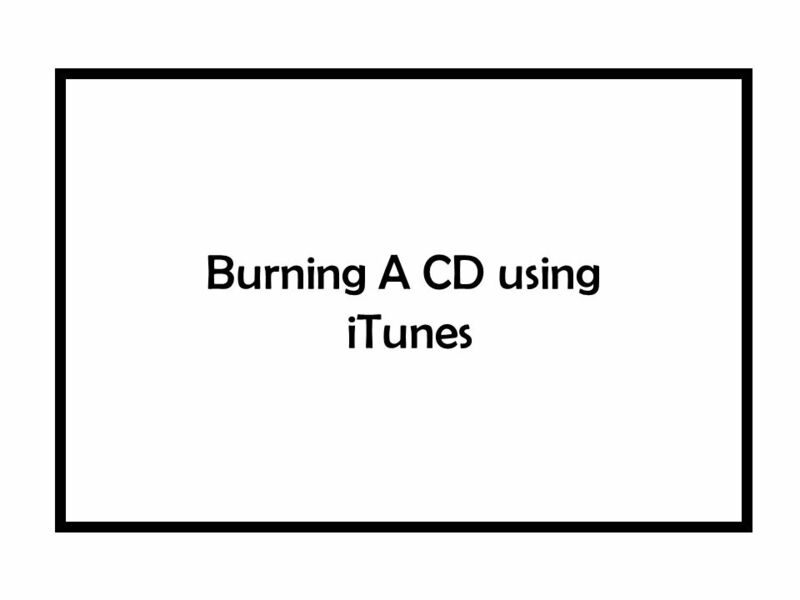 In that case please look to the section labeled Burning a CD using iTunes and follow the proceeding sections, then back to changing preferences. 7 Notice the Import Using field. 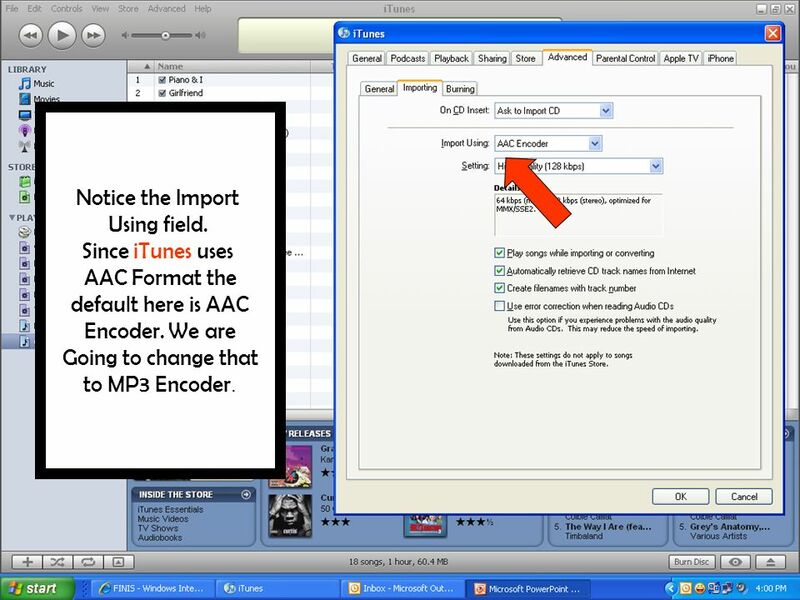 Since iTunes uses AAC Format the default here is AAC Encoder. We are Going to change that to MP3 Encoder. 8 Here is the drop down menu for this field. 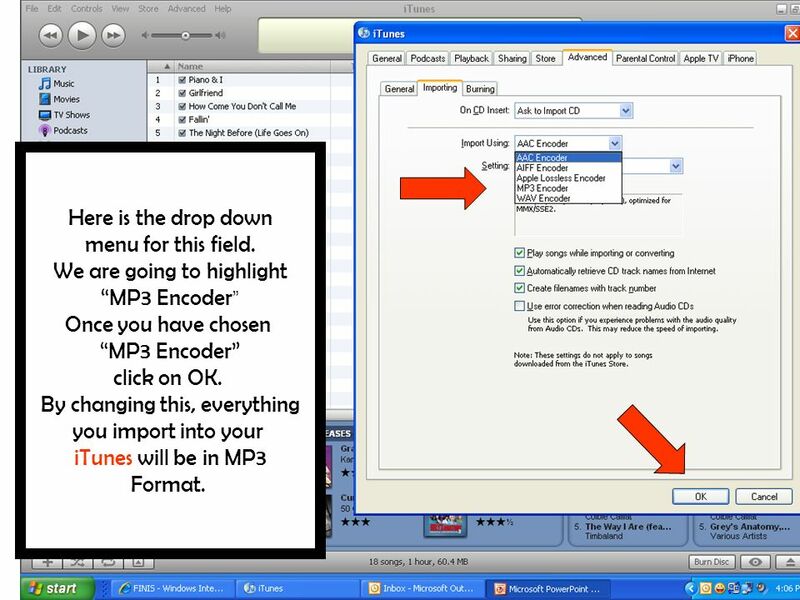 We are going to highlight MP3 Encoder Once you have chosen MP3 Encoder click on OK. By changing this, everything you import into your iTunes will be in MP3 Format. 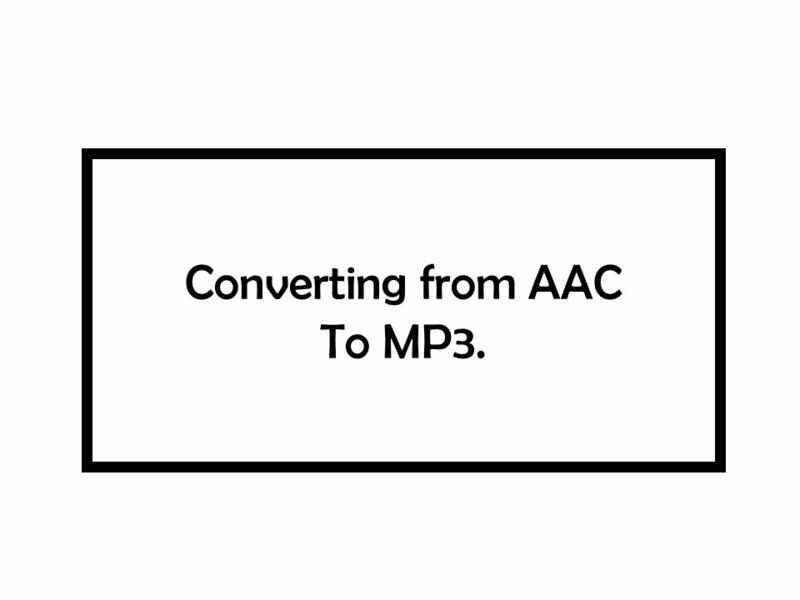 9 Converting from AAC To MP3. 10 Every song on this playlist is in AAC format. 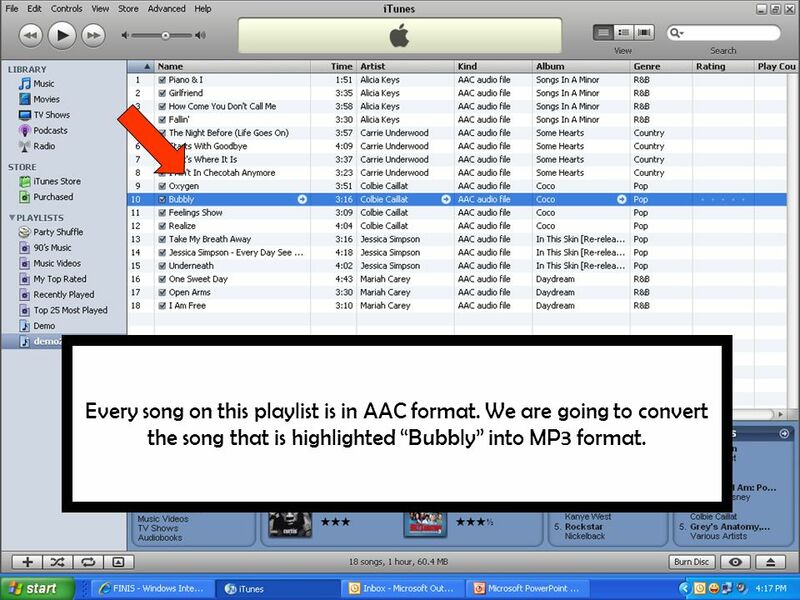 We are going to convert the song that is highlighted Bubbly into MP3 format. 12 As your songs are converting you will notice 2 things 1. 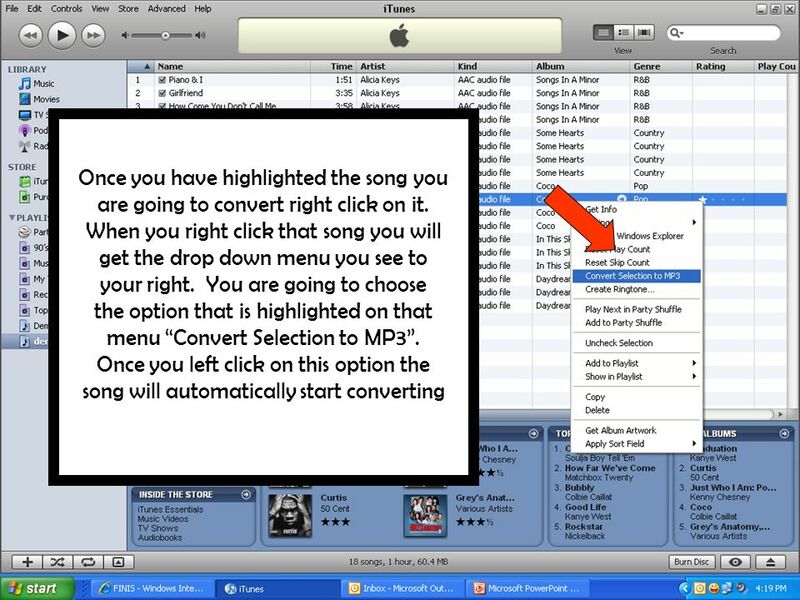 You will see Converting the name of the song at the top of your screen. 2. 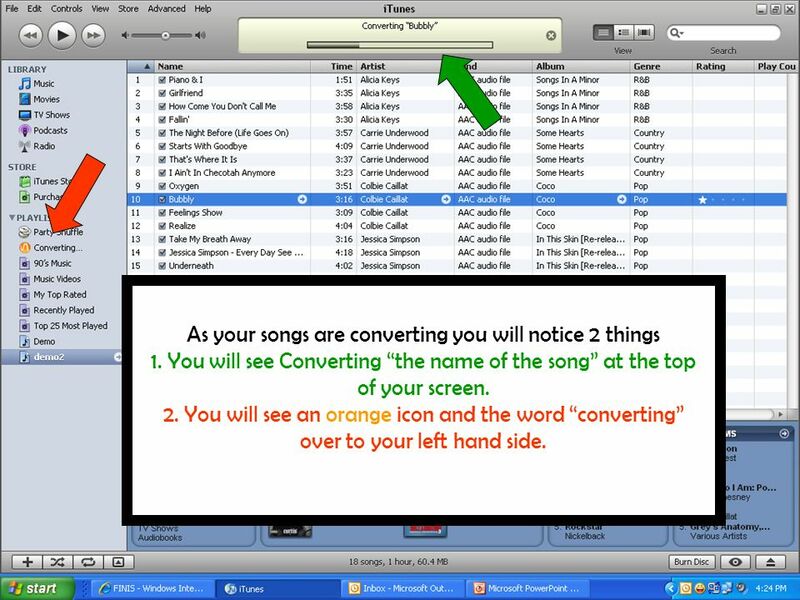 You will see an orange icon and the word converting over to your left hand side. 16 A new playlist will automatically add to your list. It will say in the box untitled playlist. 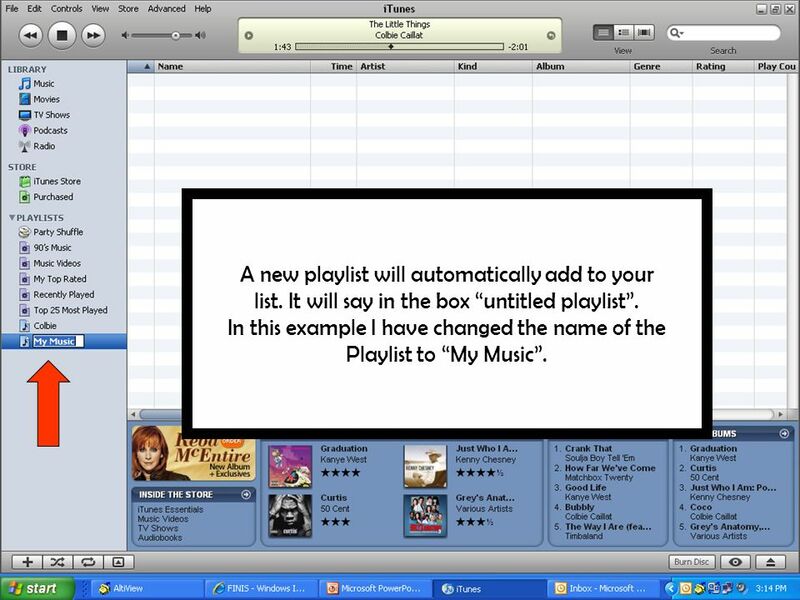 In this example I have changed the name of the Playlist to My Music. 18 Choose your playlist on the left hand side. All of your songs you just added to your playlist are now showing. At this point the only thing left to do is Burn your CD. 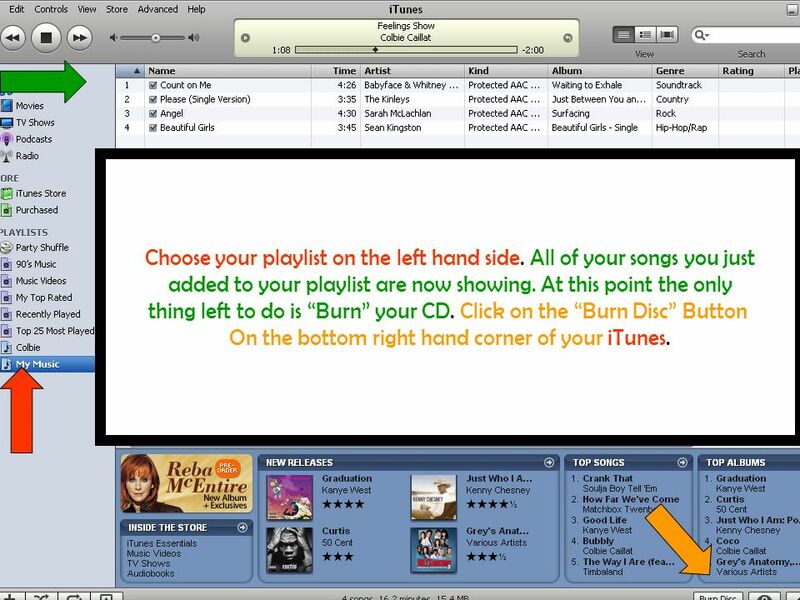 Click on the Burn Disc Button On the bottom right hand corner of your iTunes. 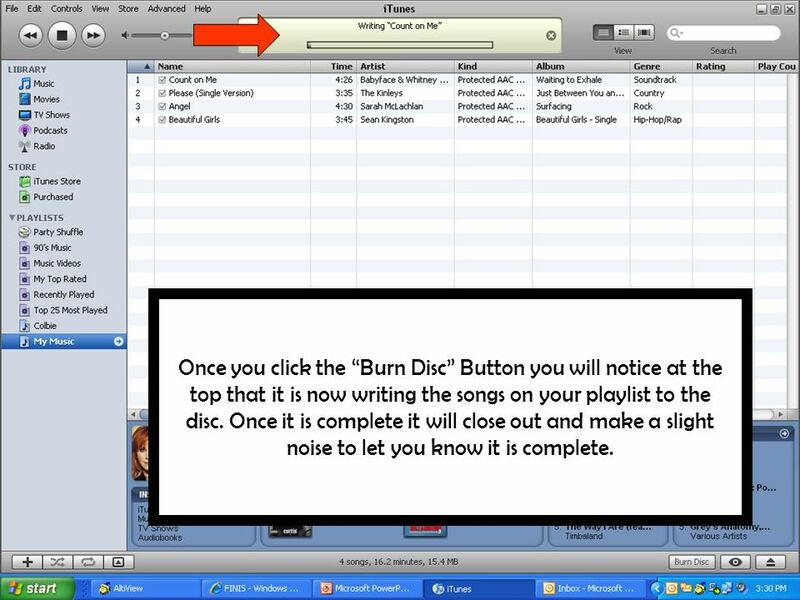 19 Once you click the Burn Disc Button you will notice at the top that it is now writing the songs on your playlist to the disc. Once it is complete it will close out and make a slight noise to let you know it is complete. 21 This is even more simple that burning a CD. 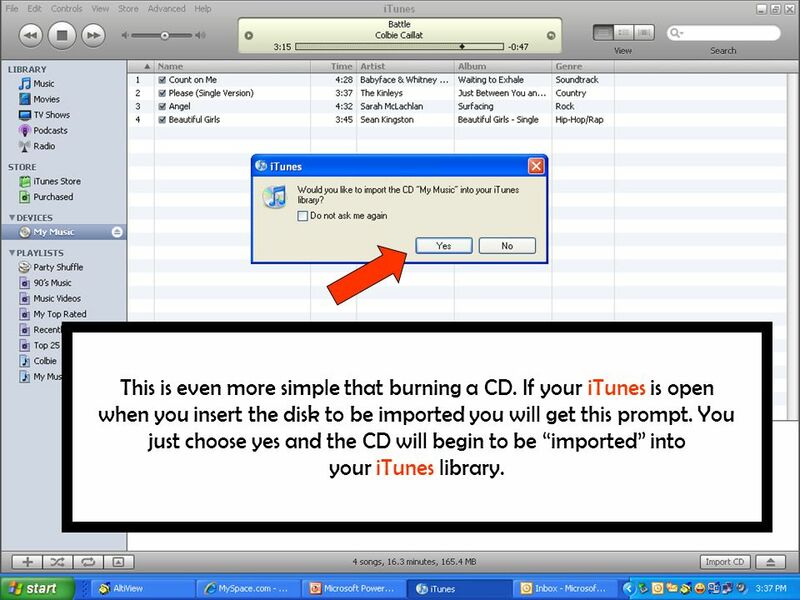 If your iTunes is open when you insert the disk to be imported you will get this prompt. 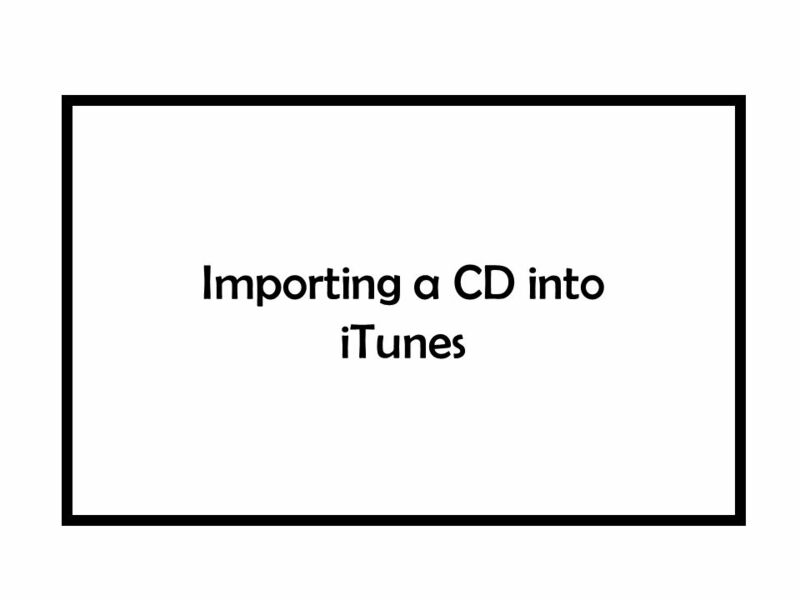 You just choose yes and the CD will begin to be imported into your iTunes library. 22 Once the importing process has started you will see two things. 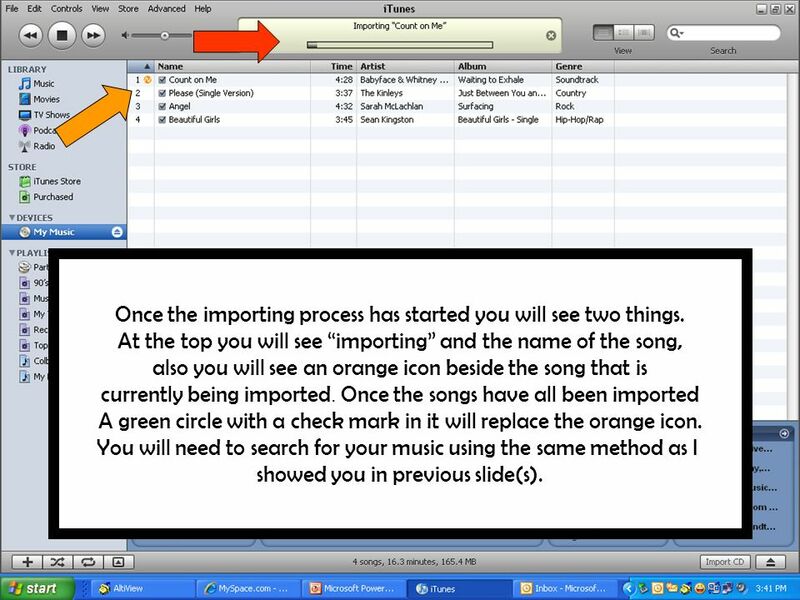 At the top you will see importing and the name of the song, also you will see an orange icon beside the song that is currently being imported. 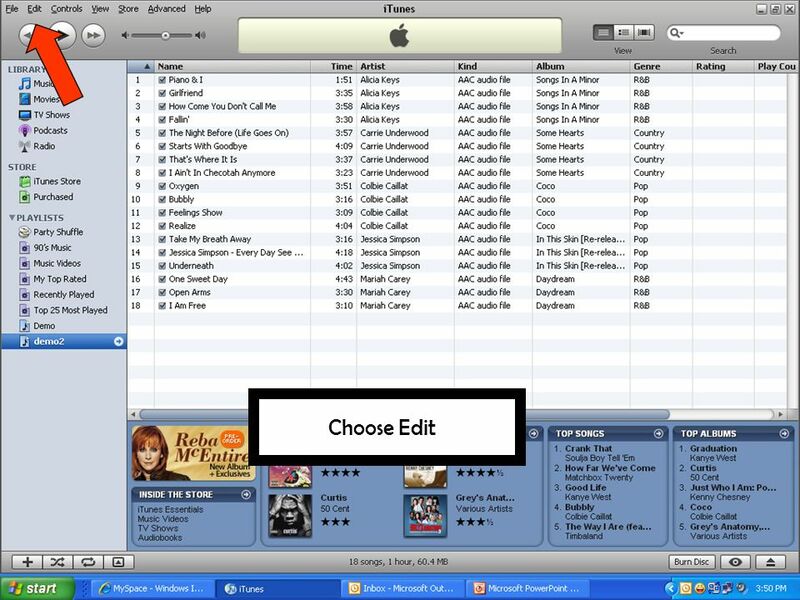 Once the songs have all been imported A green circle with a check mark in it will replace the orange icon. 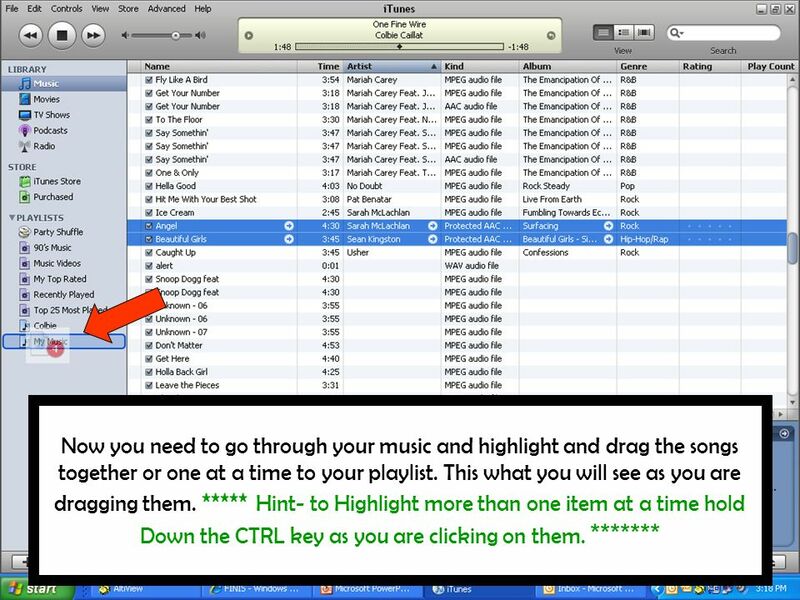 You will need to search for your music using the same method as I showed you in previous slide(s). 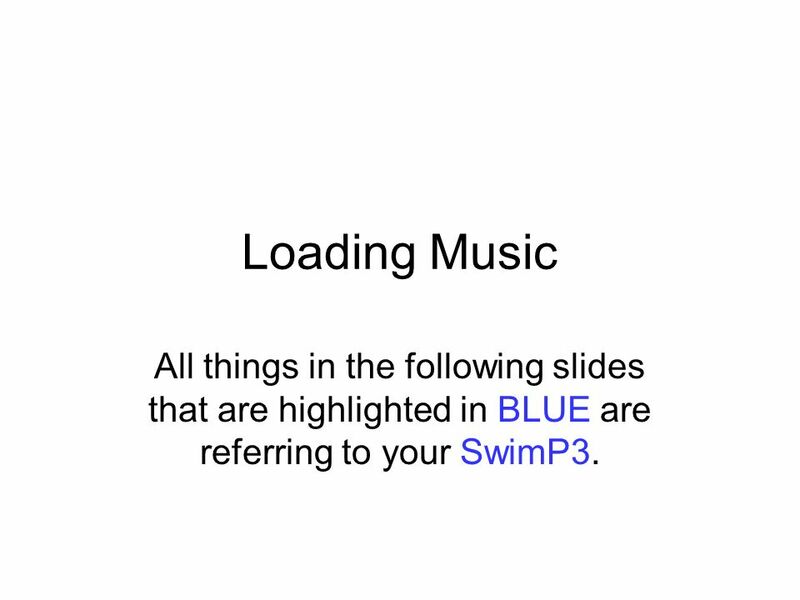 23 Loading Music All things in the following slides that are highlighted in BLUE are referring to your SwimP3. 24 When you plug your SwiMP3 player into a USB port on your computer this should be the box that appears on your desktop. If you will notice the option highlighted Open Folder. 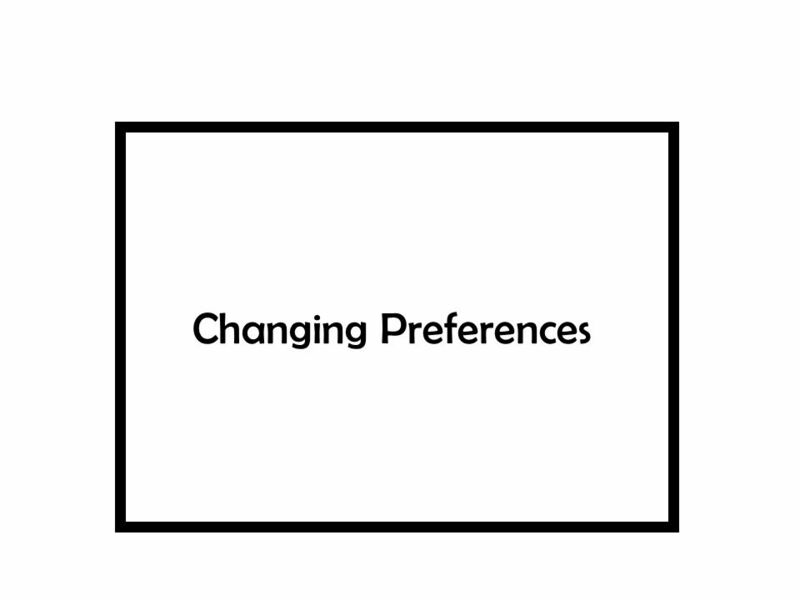 This is the option you want to choose. 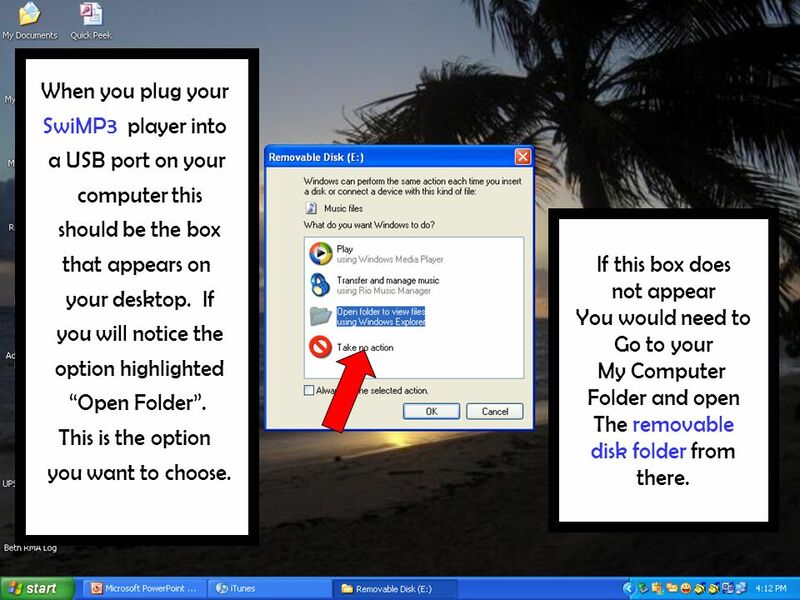 If this box does not appear You would need to Go to your My Computer Folder and open The removable disk folder from there. 25 This is your removable disk folder. Please make sure that this folder is completely maximized on your screen. 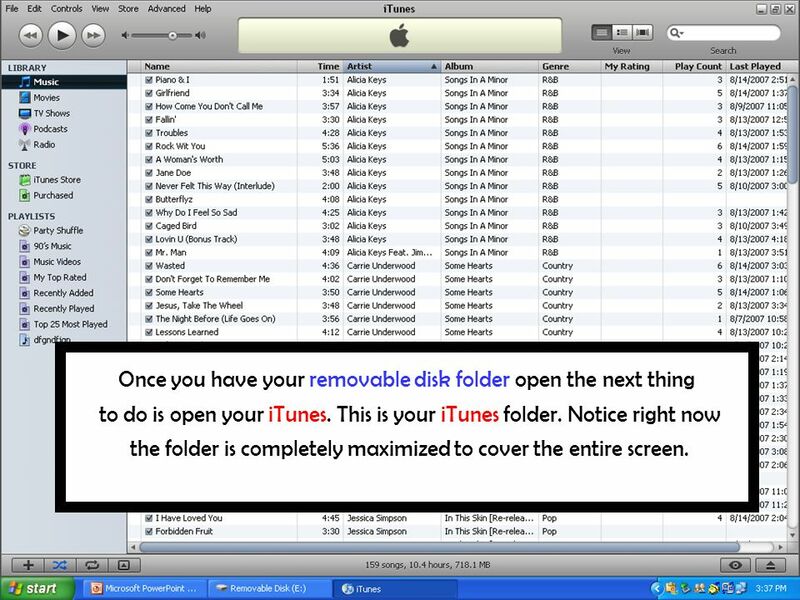 26 Once you have your removable disk folder open the next thing to do is open your iTunes. This is your iTunes folder. Notice right now the folder is completely maximized to cover the entire screen. 27 In this shot the iTunes has been minimized to show the removable disk folder in the background. 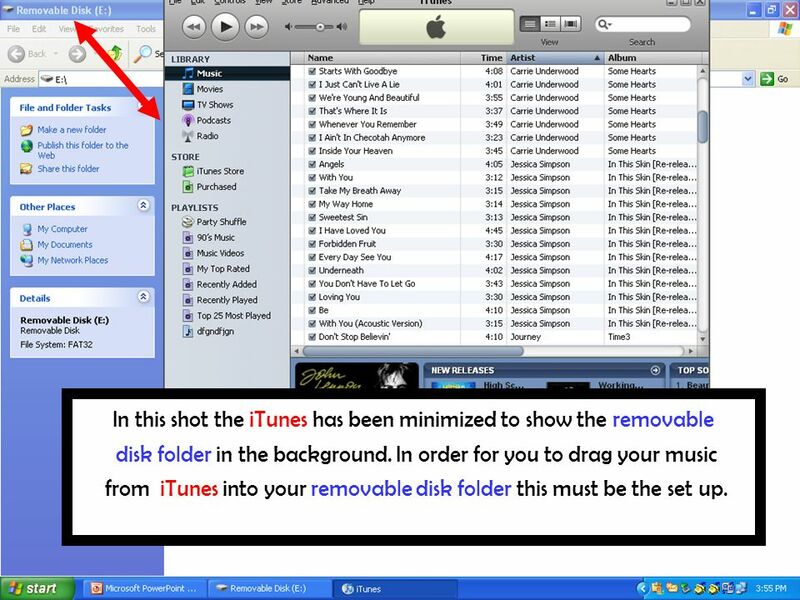 In order for you to drag your music from iTunes into your removable disk folder this must be the set up. 28 In this slide I have highlighted a particular song. 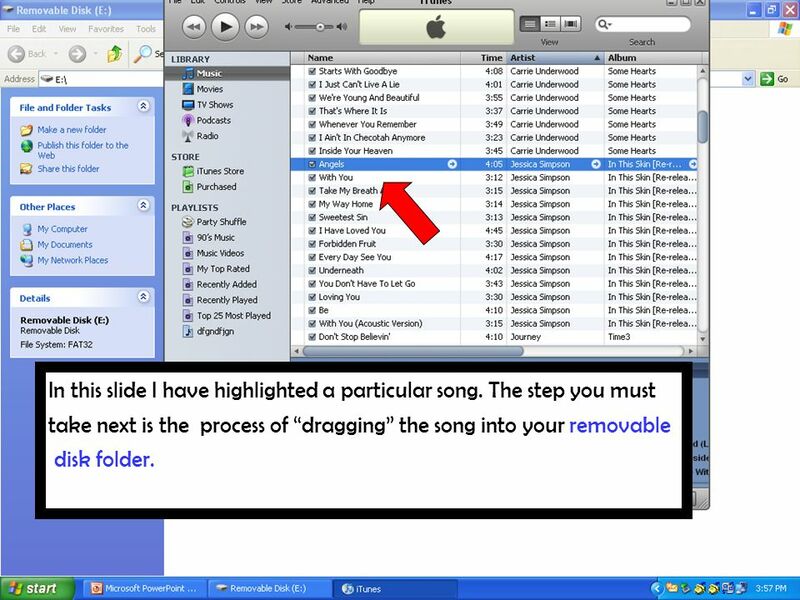 The step you must take next is the process of dragging the song into your removable disk folder. 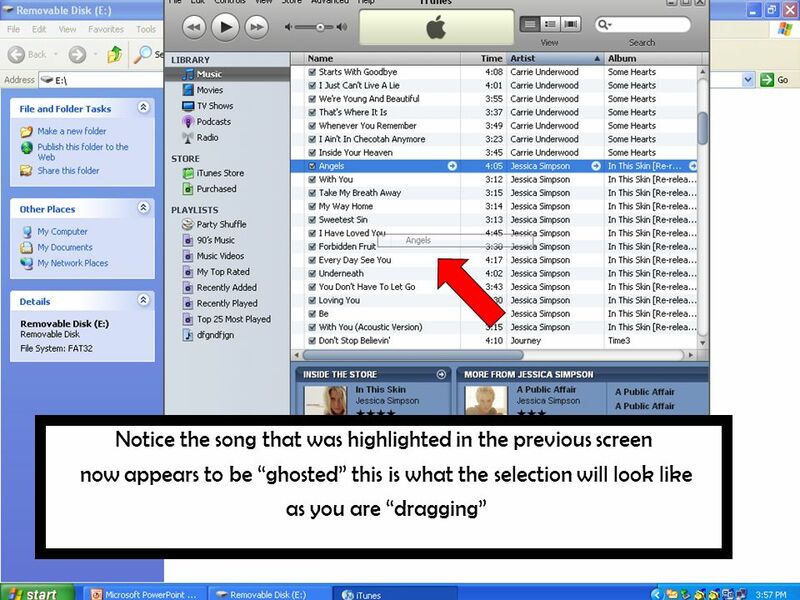 30 In this screen you see the song still ghosted but is showing in your removable disk folder. 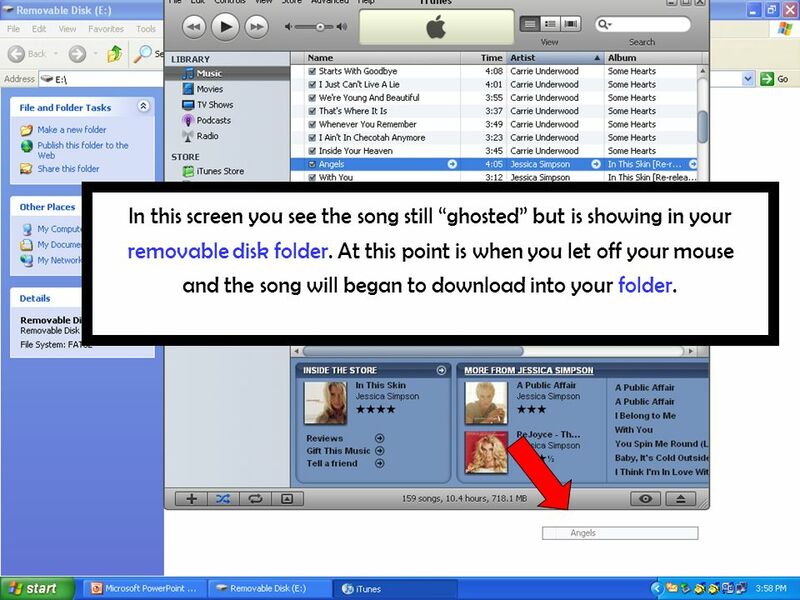 At this point is when you let off your mouse and the song will began to download into your folder. 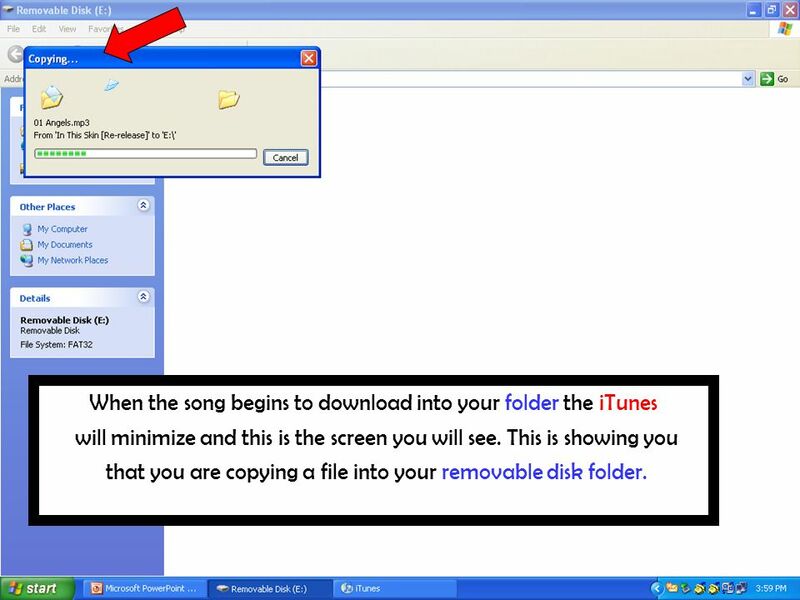 31 When the song begins to download into your folder the iTunes will minimize and this is the screen you will see. This is showing you that you are copying a file into your removable disk folder. 32 Finished product. 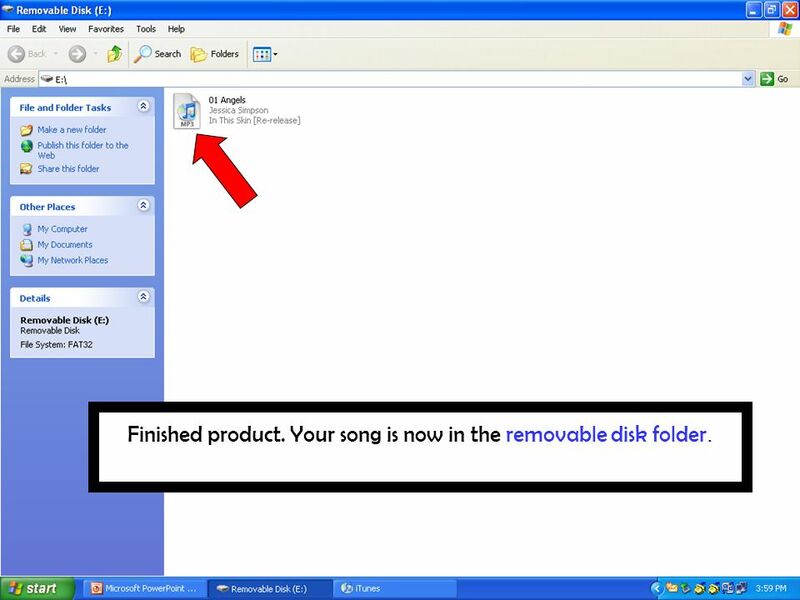 Your song is now in the removable disk folder. 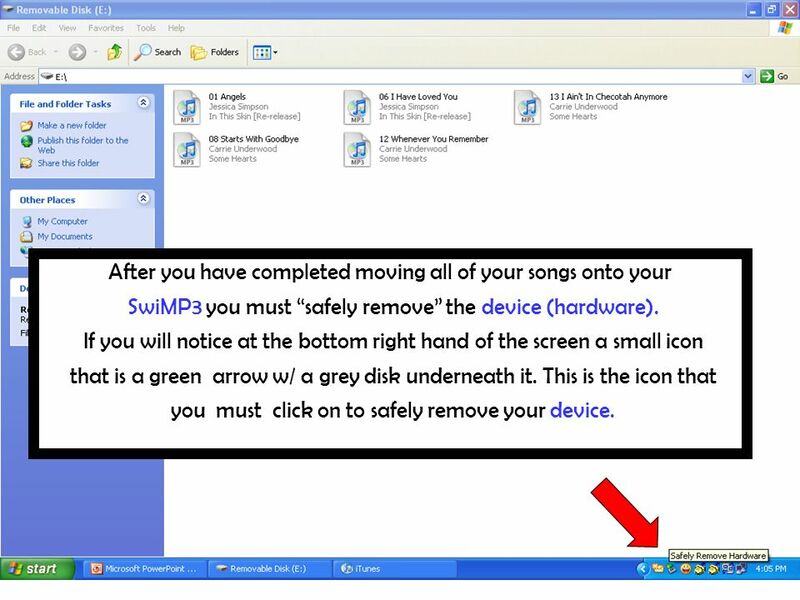 33 After you have completed moving all of your songs onto your SwiMP3 you must safely remove the device (hardware). If you will notice at the bottom right hand of the screen a small icon that is a green arrow w/ a grey disk underneath it. This is the icon that you must click on to safely remove your device. 34 Once you click on this icon it will show you a list of hardware attached to your computer Choose the drive that you have been working in. In this case it is (E:). 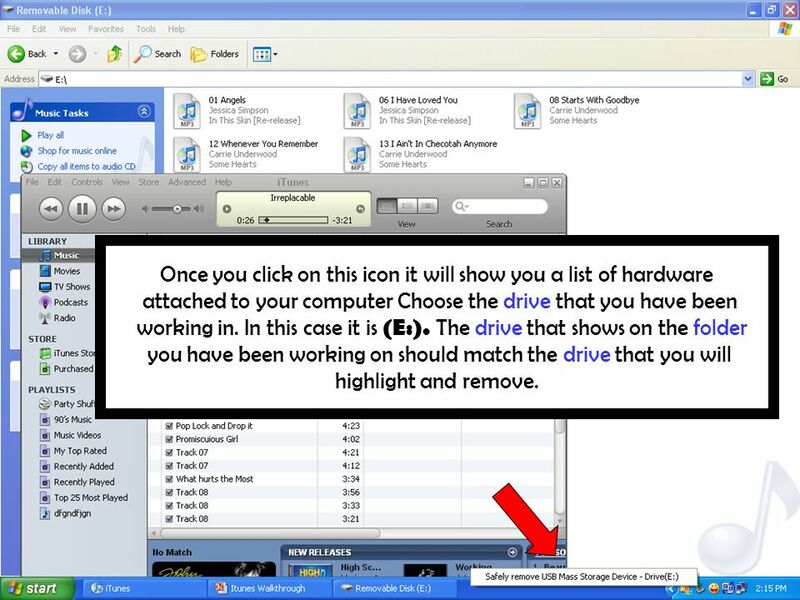 The drive that shows on the folder you have been working on should match the drive that you will highlight and remove. 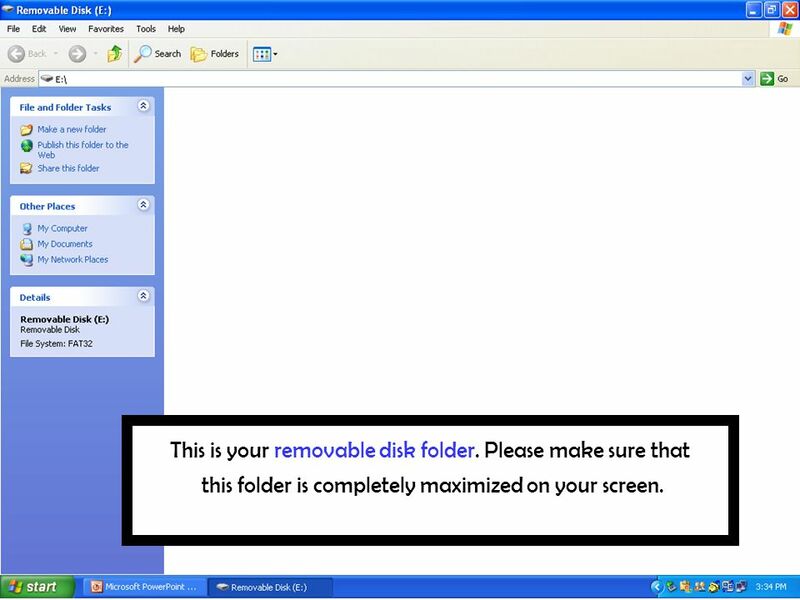 35 The removable disk folder disappeared. 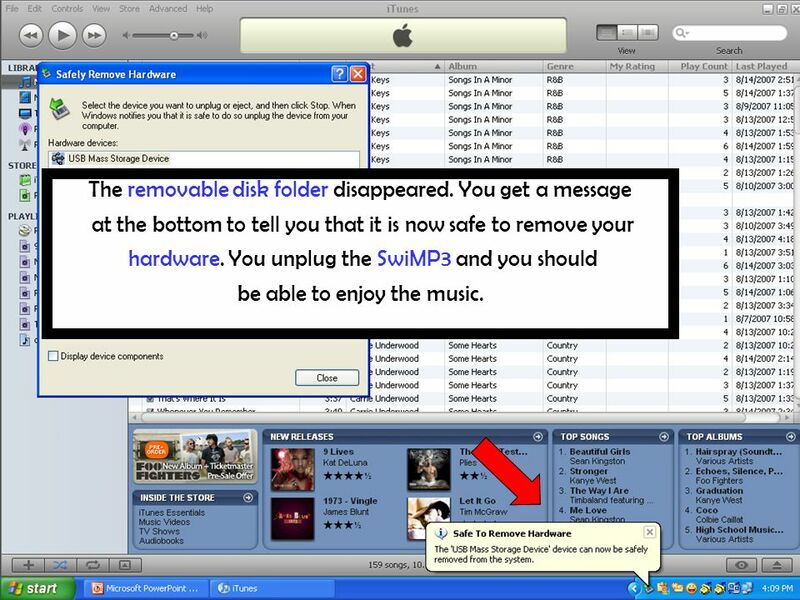 You get a message at the bottom to tell you that it is now safe to remove your hardware. You unplug the SwiMP3 and you should be able to enjoy the music. 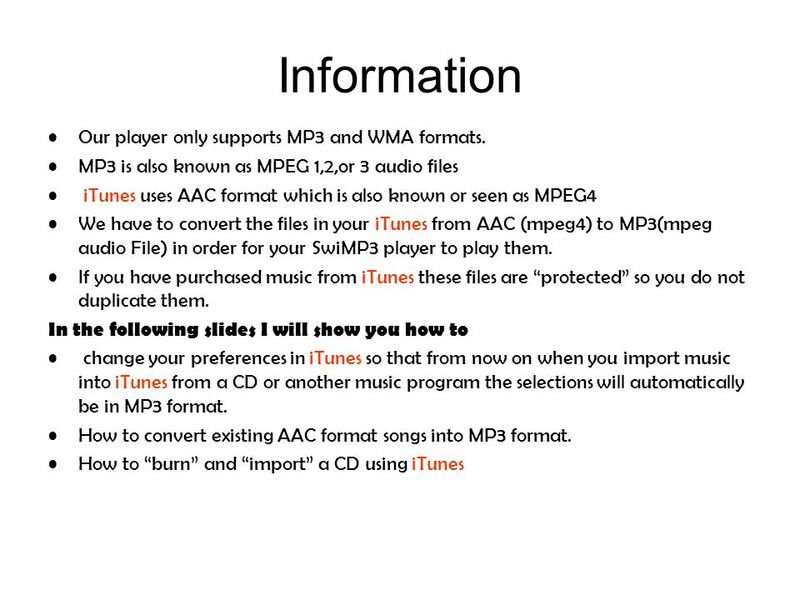 Download ppt "How to utilize your iTunes for use with your SwiMP3 Please be aware that all the SwiMP3 line of players do not have licensing to any of the songs that." TO YOUR LAPTOP How to Add a Printer Lesson 3 – November 18, 2013 – Michelle Lowe. BTEC 149. Windows Desktop Click on the Start Button. Burning a Video or File to a CD 1.Double click on the Nero- Burning Rom icon on your desktop or go to “Start” > “Programs” > “ahead Nero” > “Nero Burning. HOW TO IMPORT AND EXPORT DATA. Why do I need to use Export/Import? Here are some examples: If you have a laptop that you take home (or have a home version. BURNING A CD USING ITUNES Theresa Anderson Jon Bollinger Vandan Desai Udit Pandya Steven Sumedi. ICONS. 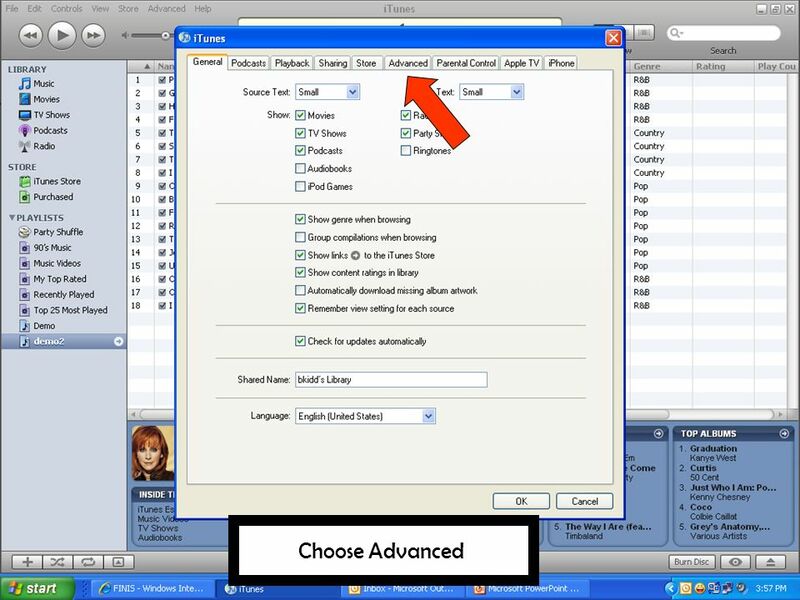 Learning Targets  I Can…  Identify the different categories of icons specific to the Windows OS  Explain the function of the icon(s) specific. This Presentation Contains Narration To hear the narration, turn on your speakers or plug in headphones. If you would like to view this slideshow WITHOUT. 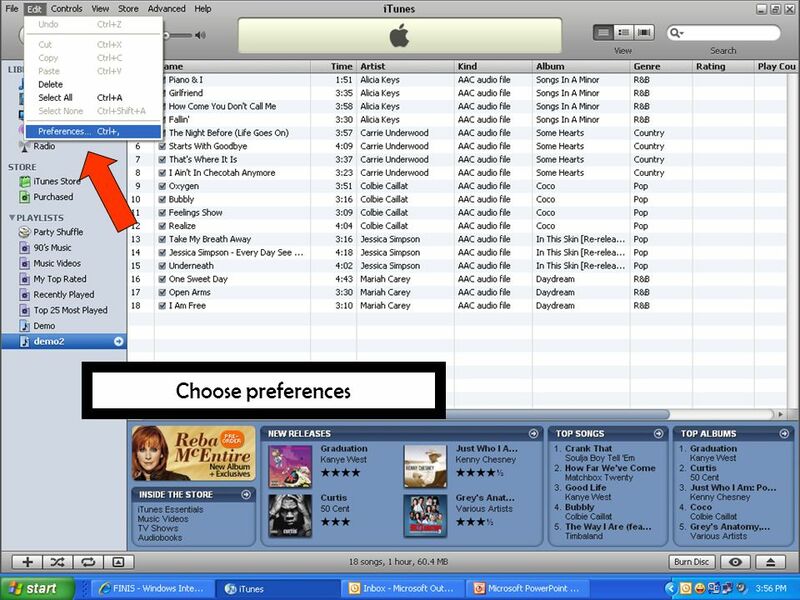 ROWAN COUNTY PUBLIC LIBRARY Using iTunes. 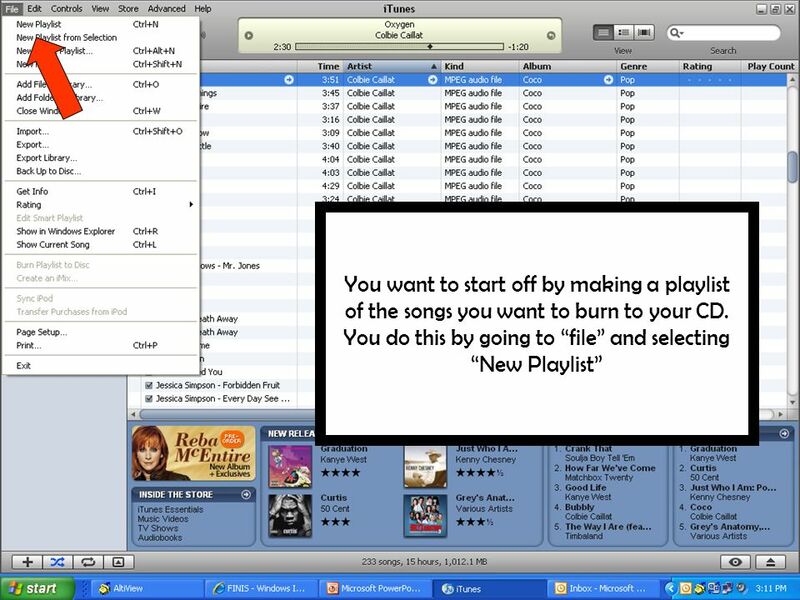 Objectives Today you will learn how to: Navigate the iTunes interface Add music to the iTunes library Navigate. REVIEW FOR SOME WELCOME TO THE COMPUTER!. WHY ARE COMPUTERS IMPORTANT?